Colombian Ambassador to the United Nations giving opening remarks in Geneva. 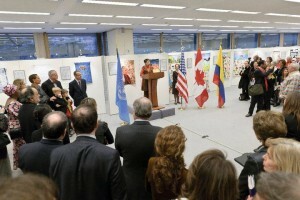 The exhibit opened at the United Nations in Geneva in March 2011 under the sponsorship of the United Nations Population Fund (UNFPA), the United States Mission to the UN in Geneva, the Canadian Mission to the UN, the Colombian Mission, the Advocacy Project and the Worldwide YWCA. 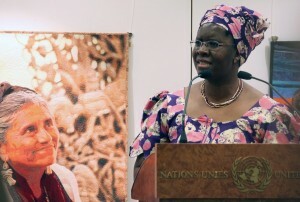 The exhibit was displayed outside the Human Rights Council Meeting Room at the Palais des Nations in Geneva, Switzerland from March 1 – 24, 2011. In addition to the seventeen quilts from Quilt for Change, two quilts from the Advocacy Project were included in the exhibit, one on Sexual Violence in the Democratic Republic of Congo and one on the Massacres in Srebrenica, Bosnia. There were also four quilts from Colombia created by the women of the village of Mampujan, who were displaced by paramilitary forces. To read the text of the U.S. Ambassador Betty King, click here.